Circa Survive bassist Brendan Ekstrom suddenly left the stage in Missouri this weekend, the Daily Dot reports. 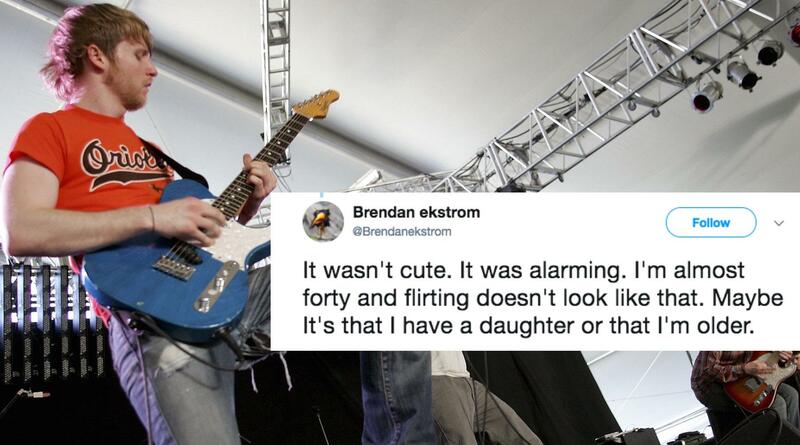 Fans at the St. Louis’ Pageant theater were apparently surprised when Ekstrom suddenly disappeared from view mid-performance, so he took to Twitter to explain exactly what went down. Quick note to those who were at the show last night. I've been doing this for 20 years and I've never walked of stage during a song before. Eklstrom said that from where he was standing, he could see a woman repeatedly pushing a man away from her as he attempted to grab and kiss her. Ekstrom tried pointing them out to security, but eventually decided he had to go down to where it was happening. See them again after that. Maybe they were removed or just moved. Maybe they were in a relationship. Maybe they weren't. Regardless what I saw from stage was disturbing to me and completely removed me from the mindset I need to be on stage. It wasn't cute. It was alarming. I'm almost forty and flirting doesn't look like that. Maybe It's that I have a daughter or that I'm older. Ekstrom says he's not sure why he reacted the way he did, since there was no way for him to know the man and woman's relationship, but something about the scene was unsettling. He says he may have been affected by a video he saw of a young man trying to make a strange woman kiss him at a gas station, which he shared as explanation. I Really don't know but it made me furious to watch a girl forcibly remove someone's hands from her body multiple times. Them standing on stage confused. And I'm sorry to fans who were equally confused and saw a bit of an unusual show.